Walls can be an attractive and functional addition to any landscape build. Some walls are simply decorative, while most serve an important function. Retaining walls hold soil in place and prevent erosion and movement, and are often used to create varying elevations or separate areas for planting vegetation. There are several types of retaining walls, with the most common being Gravity Walls, Cantilever Retaining Walls, Sheet Pile Retaining Walls, and Anchored Retaining Walls. The type of wall you build will depend on the needs and requirements of your landscape design, as well as several factors that should be considered such as type of soil and ground pressure. 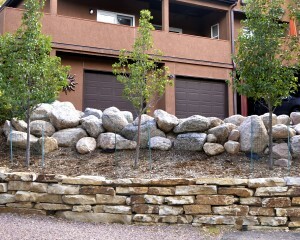 Professional landscapers, like us here at Colorado Stoneworks, should be consulted to make sure you build a wall that is best for your needs and your property. Check out the video below for some examples of our retaining walls, and contact us for more info and a free quote!